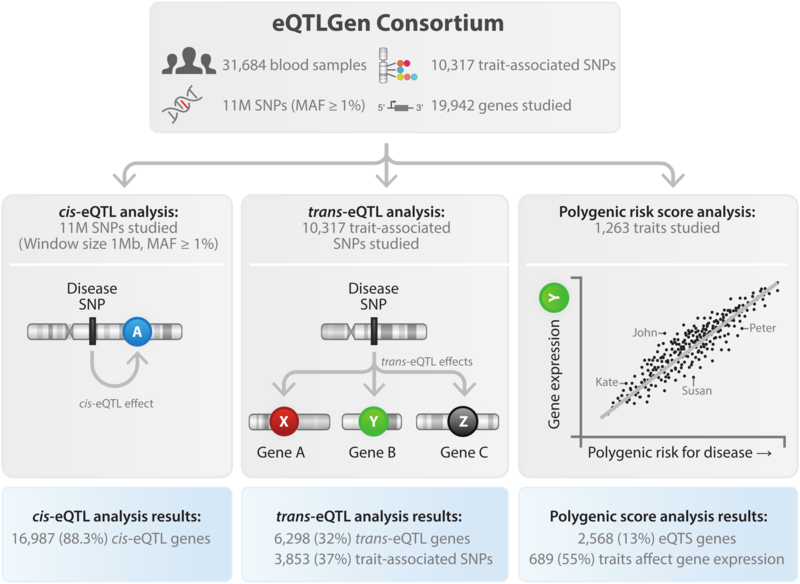 The eQTLGen Consortium has been set up to identify the downstream consequences of trait-related genetic variants. The consortium incorporates 37 datasets, with a total of 31,684 individuals. You can find the cis-eQTL, trans-eQTL, eQTS and replication results from our forthcoming paper on this website. For questions, bug reports, or requests, please contact Lude Franke (ludefranke@gmail.com); Urmo Võsa (urmo.vosa@gmail.com); or Annique Claringbould (anniqueclaringbould@gmail.com).